"Gardens Galore have transformed my garden from a challenging space to a garden that I can now enjoy. From the first consultation, through ongoing communication and to all work being done on schedule, this has been a professional project. The work has more than achieved what I hoped for when I first approached the company. Thank you." "Great workmanship. Punctual, hard working team who remained positive and cheerful even in horrible weather. I'm very pleased with the new patio, and found Gardens Galore a great company to deal with - on time, on budget and an excellent job. I wouldn't hesitate to recommend them to anyone looking for a professional landscaping company." "I cannot express how delighted I am with my beautiful garden! The team were outstanding from start to finish. Nothing was too much trouble to them. They arrived promptly every morning and left the side clean and tidy at the end of the day. They were a pleasure to have around. I am now in the process of choosing plants for the borders and cannot wait to see how the garden matures in the coming years." "My wife and I recently moved to a new Stephens bungalow in Guildtown and employed “Gardens Galore” to remove steps to the rear and replacing with a patio. Also 20 metres of Beech hedging planted to the front and a few tons of gravel to finish off the pathway areas. The work was carried out over a week or so, usually by 2 men, with extra men drafted in as required. The communication with the company was first class and I knew how and when all the various aspects of the work were to be done. The men were always punctual, they actually waited for 10 minutes or so if they arrived early..! All workers were very hard working and very polite. 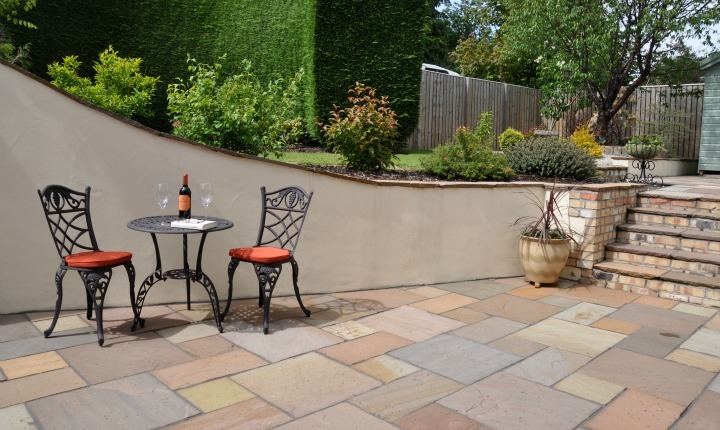 The patio was erected and the stone work and sandstone slabbing and coping completely matched our house perfectly. It looks like the patio had been constructed by Stephens homes and does not at all look like an “add on”. The finished product is first class and the work was always left extremely tidy (every day, not just at the end). Gardens Galore pricing was fair and the work was first class. I would definitely employ their services again." "I am absolutely delighted with the finished driveway and paths carried out by Gardens Galore. I have been impressed with the professional and courteous dealings I have had, from the initial contact with Kim to the site visit and quote by Jamie to the actual hand on work by the ground crew. I was kept regularly updated at all times and the deadline for completion would have been spot on had it not been for the Scottish weather. The site was kept tidy at all times. I have no hesitation in recommending this company." "I am very pleased to recommend Gardens Galore. Jamie’s costing was fair and his design was excellent. The work was carried out by Sean, Scott and Ben in a most efficient and highly competent manner. They were invariably reliable, pleasant and very well mannered, worked skilfully and assiduously and took great care to keep disruption to a minimum. We were delighted with the transformation that resulted from their industry and craftsmanship." "We are absolutely delighted with the finished look of our patio, path and raised flower beds. The work was carried out to our agreed specifications while we were on holiday. Jamie & Kim stayed in touch by sending regular update photographs. On our return we reviewed the work before the final payment was requested. The standard of work is excellent and we were very impressed all the way from the planning and design to the finished project. The overall finished appearance has definite wow factor & I would highly recommend Gardens Galore for any garden work- large or small." "Your team worked very hard, were very considerate and left the place neat and tidy. I would be quite happy to recommend your services." "We would like to thank the GG team and especially Grant for making such a great job. The craftmanship particularly the paving work was of a very high standard. The team were always hard working, tidy, attentive, courteous and provided helpful advice on options as the work progressed.We're delighted with the outcome and we are looking forward to gettingthe summerhouse ready. Thank you to you too Kim for tying everything together and keeping us informed on progress throughout." "Can I just say how delighted we are with the work done. The guys worked so hard and professionally throughout. Our neighbours also commented on how well they worked and we have received many compliments." "We found the company to be reliable and conscientious throughout the project and at all times ensured that we were happy with the progress of the work. We are more than happy with the work. Last but not least the job was finished within the time frame quoted." "We engaged Gardens Galore Scotland to complete the installation of a composite deck in two colours, a revamp of our back lawn area plus a new design for our front garden and we have to say we are over the moon with the end result. Right from the start the company were very professional, from the first site visit all the way through to the finished job. The customer care and communication was excellent, the expertise of Gardens Galore team: Scott, Garth and Ben when completing the work was outstanding." "Just a quick note to say how delighted we are with our new garden patio. From the initial meeting with Jamie through to completion we were very well looked after, and felt that everyone we dealt with throughout the process understood what we were trying to achieve....offering advice to add value. The quality of workmanship is superb!!! High quality products are used and nothing was ever too much trouble. At the end of every day the site was cleared and tidied up. The finished job has exceeded expectations! So much so we are now planning our next project through Gardens Galore. Thanks again for a great experience." "I was extremely happy with the whole experience, from speaking with Kim on the telephone, to the end result. I was kept informed throughout the process, and all went very smoothly. Jamie, on the initial visit to discuss the project, was punctual and courteous and very friendly and helpful. The team of workers, Willie, Garth and Grant, again arrived promptly, and worked like trojans, whilst being friendly and approachable. I was amazed to see how quickly the transformation took place. I am absolutely delighted with the end result. Two weeks on I am still smiling when I go into my garden. I would not hesitate to use Gardens Galore again and cannot recommend highly enough. Many thanks to all concerned." "Transforming a large proportion of our back garden was a big task which Gardens Galore completed brilliantly. From our initial consultation meeting to completion , all aspects of the job were completed superbly. The whole team had a professional approach , displayed pride in their work along with a great attention to detail . Their flexible approach also allowed for change as the project progressed. We would highly recommend Gardens Galore if you are looking for company to landscape your garden to a very high standard whilst delivering great customer service." "We are delighted with the work done. The tradesmen Grant and Willie were excellent and we would have no hesitation in recommending your firm to others." "Just a wee note of thanks for the work you've done at our house. We are delighted with the end result, and wouldn't hesitate to recommend you to our friends & neighbours. Please pass on our appreciation to Jamie, and particularly Willie & Grant who were an absolute credit to your business." "We are delighted with the transformation of our back garden. Your workmen were courteous and well mannered and their work went above and beyond our expectations. We would have no hesitation in recommending your firm to anyone interested in garden transformation." "We were delighted with the professionalism of Gardens Galore. Communication was excellent throughout the whole job and the team produced a top quality job. A minor snagging request was dealt with very promptly and efficiently. Thanks again." "Thank you for your help, my wife and I are delighted with the new garden. I look forward to my shed arriving on Friday. Your team were fantastic, nothing was too much bother, and they were respectful to my wife, myself, and our property. I would not hesitate to recommend Gardens Galore." "Love our new garden design, the guys were trustworthy and polite and did a fantastic job. Would highly recommend Jamie and the team at Gardens Galore." "We are delighted with the transformation to our garden. The team who worked on the project were highly skilled and very focused on customer satisfaction. We would have no hesitation in recommending Gardens Galore to anyone considering a garden project." "The team arrived as planned complete with all equipment necessary for the work. The project was planned to take 3 days. Over the 3 days the lads worked hard firstly removing the spoil and waste, effectively on day 1 the subbase was in place. The actual laying of slabs and edging was carried out over the next 2 days. Throughout this period the worksite remained extremely tidy, slabs and edging were laid to line and level with no fuss. By the last day the patio was in place and garden reinstated with very little evidence of work having taken place. The team remained polite and professional throughout the construction highly recommend this team and would be only too happy to have this crew back on site." "My thanks to Jamie for working with me to modify my "wants" to what I could afford and for translating that to Scott who, with his team have done what I hoped for and more - it's perfect. Thank you all." "A big thank you to Kim in the office, Scott, Jamie and all the guys who worked on our garden project. All the guys were hardworking, tidy and very professional, nothing too much trouble. We are delighted with the first class service provided and the end result and only too happy to recommend the company to all. " "Following a useful discussion with Jamie about what we wanted done, we got a clear quotation and decided to go ahead with patio areas, path and summerhouse base. We’re very happy with the results. Garth and Sean were good, and pleasant, workers and we really admired their dedication to duty on a couple of really horrible wet days. They also left everything very tidy each night and on completion. We would certainly recommend Gardens Galore." "Dear Kim, This is just a short note to thank you for the efficient job that you and your team carried out for us. Especially Garth, Shaun and Grant who worked extremely well in all weathers to produce what we wanted. I would recommend your Gardens Galore to friends and family. Thanks once again"
"Just wanted to say a very big thank you to all the staff involved with our garden makeover, which is absolutely fantastic. The way the team work is marvellous , the care and attention to detail is superb and I would have no hesitation in using your services again in the future . I will also be recommending you to friends and family alike. Many thanks once again." "Dear Kim, We are delighted with the work done. Jamie's design is perfect and the build quality excellent. We were not sure exactly what it would look like but Sean and Grant, overseen by Scott, were happy to come and go with some minor changes as the project developed. Please pass our thanks on to them and to Michael. They were all hard working, punctual and very pleasant to deal with. Our thanks also to you for keeping us up to date with the plans and scheduling in a charming and professional manner." "Just had a pergola and raised flower bed installed by this family run company. They were extremely professional from start to finish and incorporated some of my personal ideas into the completed construction. We are delighted with the end results and will definitely utilise this company for any future garden projects." "I would like to say that from beginning to end with my garden project I could not have been happier. The staff who carried out the work were very friendly, pleasant and professional from the day they arrived until completion of the work. I would also like to mention that I was given regular updates as to how the project was progressing. At the end of each day you would not know that there was work being carried out in the garden as everything was tidied up before they left the property. It was such a pleasure working with Gardens Galore as everything carried out professionally and to a very high standard. I am so pleased with my new decking that I cannot wait for a nice sunny days in order to sit out and enjoy it. I would not hesitate in recommending Gardens Galore to friends and family. Again I would like to thank everyone at Gardens Galore." “It has been a total pleasure working with everyone in the firm and I will be recommending the company highly wherever I can. The workmanship was of the highest standard; any concerns/ changes were carefully considered and acted on promptly. An A1 service all round." "Thank you very much to all at Gardens Galore for my fantastic garden. The guys did a great job, they were polite, hard working and professional. We would recommend Gardens Galore to anyone considering getting work done on their garden. They are more expensive but you only get what you pay for." "Many thanks for your professionalism throughout. From quote to completion everyone has been brilliant. The boys on the job were lovely and kept us informed every step of the way. Thanks again." "Thank you so much for an excellent job you did here last week. Not only does it look terrific but it was brilliantly tidy and the team so nice and helpful. Well done !" "We have had extensive terracing work done at the front of our house. From the outset the ideas suggested were practical, visually appealing and imaginative. The materials used were totally in keeping with our house and surroundings. The extensive work subsequently carried out was of the highest standard, completed on time and within budget. The team from Gardens Galore was extremely friendly, helpful, skilful and accommodated any slight changes. We would happily recommend their outstanding service and work to anyone. Thank you." "I would highly recommend anyone thinking about a garden project to use Gardens Galore, the work was carried out efficiently and to a high standard, everyone involved was polite and attuned to customer service." "This is just to say thanks for the great job you did in transforming our dreary back garden into a wonderful, useable space. The guys who did the work, Garth, Michael and Sean, were first class and very helpful with a couple of ‘additional’ little jobs - they concreted in a new bird feeder for us and put in some bricks to finish off what would have been a rather ugly edge to the work. They left the drive and pavement spotless every night, and they were on time every morning (8:00) and worked through until 4:30. We wouldn't hesitate to recommend you to anyone looking for quality work on their garden. Best wishes for the future." "Excavation and levelling of garden including removal of large trees, patio laid and turfed. Job completed in 4 days to excellent standard, reliable, tidy and polite tradesmen completed the work." "We have used your company's services twice in the past both to our complete satisfaction. This occasion was no different: the standard of workmanship was excellent, we were kept abreast of progress daily and the Team, led by Grant, was invariably courteous and considerate. We wish the company well in the future." "I am very pleased with the work carried out by the Gardens Galore team. The project was discussed and agreed in advance, and carried out to my complete satisfaction. Any slight problems were dealt with immediately. The men arrived promptly on the agreed day and worked methodically and carefully until the job was finished. They were tidy and polite and I shall recommend them to my friends." "I am well pleased with the work that has been carried out. The team were efficient, professional and courteous. The completed project has enhanced my garden." "This was a professional job from start to finish. Staff are all hard working, friendly and considerate. Job was done on time and to budget. Possibly the best landscape garden company in Scotland." "We are absolutely delighted with our garden! Many thanks to the whole team for a very professional job. The guys on site were polite and helpful and finished the job very quickly. We are amazed at the transformation and we are really looking forward to entertaining our family and friends on our new deck. We would recommend your company to anyone for their own garden project." "We are a young family, just settled into a new house and decided to make the garden spaces, somewhere more functioning for our 2 young boys, both the front and back garden were mature and mainly chipped. After saving some pennies for some landscaping, we decided to get both gardens done in time for the sunshine. Like most people I did some research and got a couple of quotes, I went for one of the cheaper options! Following what only can be described as a “cowboy” job on our front lawn, Gardens Galore came in and completely re-laid the lawn. To explain, I went with the cheaper quote, from a company which had been earning some good reviews and lots of shares on facebook. Their work looked good, and they were considerably cheaper. We wanted a new lawn in the front garden to replace a few mature shrubs and bushes and a few tons of chips. I thought it would be hard to get wrong…..it wasn’t a big landscaping job, but my naivety was punished… the workmanship was terrible, chips still under the turf, when we walked on it after a couple of weeks, it crunched under foot, there was no proper edging….. it was a mess, too much wrong with it to list here!!!!! So I went back to Jamie at Gardens Galore and they came and ripped it all up and started from scratch. Digging down the appropriate depth and putting down some soil before correctly laying some quality turf. We then asked them to landscape our back garden, with 2 small boys we need somewhere they can run around, somewhere functional for them and us. We wanted a decking area, somewhere to house the shed, and to try and incorporate the trampoline. Our garden was also really uneven, a huge slope away from the house, with huge trees shadowing the whole garden. Jamie and his diligent team completely transformed our space. The outcome was impressive, it’s a great space and we’re delighted with the result. From start to finish, Jamie and the team listened to what we wanted, and delivered in style. They worked very hard to complete on time, they were really clean, friendly and their workmanship is top class. I would highly recommend Gardens Galore to anyone looking to make a landscape change!" "The landscape work carried out by Gardens Galore, was started on time and completed on time. The work was of a high quality, in fact additional work was done at no extra cost ! The gardeners were polite and helpful and a pleasure to communicate with. The instant response from Kim in the office, whether by email or telephone was another bonus. They are not the cheapest, but undoubtedly the best ! " "We are very happy with our garden. The gardens galore team have been professional from start to finish, they are punctual, work very hard, listen carefully to the client needs and provide guidance which is relevant and sound. They have exceeded our expectations and delivered a garden which is pleasing to look at and uplifted the external beauty of the house. Come rain or shine they work through regardless pushing to complete the project on the promised time. I can safely say that if you want your garden ideas and aspirations come to life then gardens galore are the people to get in touch with. Thank you once again to the entire team for their help." "Our garden has been transformed by Gardens Galore. From the first meeting to discuss the job to the final phone call on completion - I couldn't fault the customer service or the work. I was sent a quotation quickly and we arranged a suitable date for the work to begin. They worked hard from beginning to end - including having to transfer 8 ton sacks (I think) of bark uphill by wheelbarrows. At the end of the day they tidied up after themselves and were brilliant. We now have a calm slope with a beech hedge and selected shrubs - it looks beautiful and we couldn't be happier." "I have to say what a pleasure it has been to work with your company. Every step of the way you have shown yourselves to be 100% professional and customer-focused. Scott, Sean and Mike have all been brilliant, extremely tidy and have done everything they can to make sure inconvenience to us, and our neighbours, was kept to the absolute minimum. The quality of their workmanship - and the materials used is first-class. I wouldn't hesitate to use your company again and will be very happy to recommend you to other people. Please pass on our thanks to everyone involved, including those behind the scenes who make sure the right materials turn up at the right time etc." "I'm not sure how to begin this review, we had a quick look at existing testimonials on your website and there were no adjectives left for us to use.We contacted yourselves on the strength of other peoples reviews and can honestly say now our work is finished we agree wholeheartedly with every single one of them. In short we have never had the pleasure of having such a professional team of lads on site, Scott, Shaun and latterly Garth were so friendly, polite, professional, highly skilled, hard working and all round legends. They transformed a very ugly concrete wasteland into a beautiful paved area where we can now sit out and enjoy the outdoors. We are absolutely delighted with the result, and would recommend Gardens Galore to anyone thinking of a garden makeover, in fact we are now considering another part of our garden which seriously needs help, so the team could be back again before long. Thank you to all involved at Gardens Galore, you are all true legends." "Garth and Shaun have just completed my project. The work was completed to a very high standard indeed. They were professional, polite, neat and tidy and their attention to detail was first class, as was making sure their work was top class which was really refreshing. They kept me informed about the project every morning and answered any questions I had. They did not rush as they were focused on quality and getting it right. The project was completed on time and on budget so very happy. Kim from the office is a delight and kept me right from my first phone call through to completion. Jamie was very friendly and knowledgable and his design was excellent. I cannot recommend the team highly enough. If you want professionals who go the extra mile and create the perfect space then they are the company for you especially Garth and Shaun! I have a high quality, beautiful garden which I know i will get years and years of enjoyment from." "Outstanding Service – From the moment Kim returned our e-mail the whole process has been nothing but Highly Professional and customer focussed.Jamie came out to look over the area in which we were intending to get decked and talked us through the whole process, the pro’s and the con’s of varying woods and finishes and all post care and maintenance tips – even though we were still to look at another (x2) companies for price comparisons we immediately felt that Jamie and his team were already firm favourites purely down to the professional interaction that was afforded us from the get-go. Due to the cancellation of another job the team had, they asked us if we wished to bring our project date forward due to availability in a busy period for them from which we immediately accepted. Scott and his team were on site for 2 days in total and from the very moment they set foot onto our soil they worked meticulously and effortlessly to ensure not only their deadline was met but more impressively that all work was at the very highest standard and we as the customer were happy. Scott and his team’s bearing and manners were impeccable which can be a rarity nowadays unfortunately, it was an absolute pleasure to have these gents on site and an impeccable job was done. They even helped correct a small DIY Project hiccup for me- Legends!" "We cannot recommend highly enough the whole team and the whole experience of working with Gardens Galore. From the first moment of contact when you phoned to say you had received our email we knew we had picked the right people for the job. With Gardens Galore we had fantastic communication throughout the whole project, from that first phone call and then subsequent visits to assess the work required, right up until completion. Your contract of work was very clear and precise and you certainly delivered on timing and expertise. The landscaping team are a credit to the company and have made a fantastic job of our new patio, path and stone wall. Their customer care and attention to detail goes beyond all expectations. We are absolutely delighted with the whole experience of garden renovation and landscaping that you provided and look forward to contacting you again in the near future for the next stage!" "Gardens Galore have done four projects for me over the last few years and have totally transformed my garden! They are professional, highly skilled and hard working and I have been extremely pleased with their work. Their commitment to providing a bespoke service is second to none, from the initial consultation to the end result. I would highly recommend them." "Gardens Galore provides a high quality, efficient and friendly service. I am delighted with the projects they have undertaken for me which have been finished to a high standard and with the garden being left clean, tidy and debris free. I have no hesitation in recommending Gardens Galore to anyone considering garden renovations." "This was my first garden project and I was looking for a landscaping company with a reputation for reliability and service to provide a low-maintenance solution for my drive and front garden. I am happy to say that I have been impressed with all aspects of the work done by Gardens Galore. From the initial planning through to the day-to-day management of the project, the company provided a thoroughly professional service. Deliveries of materials and uplift of debris and rubble had been carefully scheduled. At the end of each day, the site was left clean and tidy. I thought the team who built the drive and paving were first-rate. They were happy to answer any questions and clearly took pride in their work. I am delighted with the finished project and would go to Gardens Galore for future landscaping work." "Jamie provided an estimate to landscape front garden. He provided advice and suggested alternative options, the estimate was supplied within 48 hours and didn't involve any hard selling. Once the work was scheduled Jamie and his team arrived and carried out a professional, friendly service, the end result is better than I expected. Would highly recommend Gardens Galore." "We are very pleased with the work Gardens Galore did to our front garden, the job started and finished on time, the workmen were very polite, tidy and hardworking. The finished work was of a high standard and it looks really good. We would have no hesitation in using Gardens Galore in the future." "Gardens Galore have recently turned a very untidy, messy area of my garden into a lovely patio area. The men were very friendly and helpful, were always here on time and always tidied up before they left. I am very impressed with the final result." "Process from first contact through detailed quote and carrying out the work was very professional. We are very pleased with the work Jamie and his team carried out." "I had planned to gradually transform my boring new build garden into a cottage garden over a few years, however health issues meant I could no longer do heavy digging. The guys came out and worked through bad weather basically digging up my whole lawn, then laying a new patio, new smaller lawn with edging and planting over 100 plants. I can't wait for these to grow and give me my cottage garden. Very pleased with the transformation. The work was completed very quickly and to a high standard." "I just wanted to say again a very big thank you for you and your excellent team in doing such a great job on the Patio's. We are so pleased in how it looks! Please thank your guys for us again. Your so lucky to have salt of the earth men working for you, it's so hard these days to get good men like that who are all so passionate in the gardening." "Gardens Galore have just completed a makeover of my rear garden and I am delighted with the result. The project involved the replacing of a large cobbled patio area and lawn with decking and artificial grass and entailed a substantial amount of excavating and preparation. The Gardens Galore team did a fantastic job over a 2 week period during which the weather was absolutely horrendous, however the guys just got their heads down and completed the work on time. All of the team were polite and courteous and made sure everything was clean and tidy at the end of the day. For anyone considering a garden makeover, I would definitely recommend Gardens Galore. An excellent professional company who carry out their work to a high standard within the agreed timescale. Well done guys." "When Jamie arrived I asked "Mine is a small garden will you still be interested as I've had others who promised the world and didn't even reply" Jamie said yes without any hesitation. Gardens Galore are not the cheapest but quality costs. They kept to all their promises. Their guy's work ethic is second to none. The weather was dreadful but they kept working. This was a week when extremely strong winds, torrential rain and snow battered our garden, but the guy's never stopped. Job completed within the week and very tidy with it. Professional to the last." "Gardens Galore recently erected a new 40m long featherboard fence for me. The team were punctual and professional, and worked extremely hard in very unpleasant winter conditions to complete the entire job, which included removal of the old fence, in 3 days. The customer service on the admin side was also first rate, and I would have no hesitation in recommending them to others." "We have used Gardens Galore on several occasions in the past on a variety of jobs some of which involved extensive landscaping and garden design including building walls. This recent work required an extension to an existing wall, building a new one, designing and creating a rockery, the replacement of a wooden ramp with slabs/slates and some returfing of a grassed area. Given the circumstances, we know the owners and the workforce very well and they always do a professional job, are very flexible in response to changed options as they progress with the work, are particularly courteous and mindful of the customers property and clean up every night before they leave the job. The fact that we have used them on so many occasions reflects our degree of satisfaction with their work and we are therefore happy to recommend them to any prospective customer." "Our neighbours had had a landscaping project carried out by Gardens Galore. We were impressed with the way the work was done as well as the quality of the end result and decided to get a quote from them for some work that we had been planning to get done. Jamie Byiers, owner of the business, came to have a look at what we were planning. We discussed the project and Jamie was able to give us some suggestions as to how our plans might best be realised. We received a prompt quotation which was reasonable. It is fair to mention here that Gardens Galore are not cheap but, if you want a job done properly with high quality materials and workmanship you couldn't fault, you're not going to get that for peanuts. The work was started on the date we had been given. The "boys" were good workers. They turned up each morning on time and worked well throughout. Preparation was comprehensive: these guys don't cut corners. All work was done with care and to a very high standard. They tidied up after each day's work and hosed down the area so that we weren't tramping through mud (the weather was not what you would have chosen!). The end result was a serious improvement to our garden. We are well pleased with it and it has been much admired by friends. All communications with Jamie, the boys and Kim in the office were polite, friendly and helpful throughout.I wouldn't hesitate to recommend Gardens Galore to anyone wanting a landscaping project carried out to a high standard by people who know exactly what they are doing." "Very impressed with all aspects of my interaction with this firm. They were helpful, informative, and reliable and I am very pleased with the resulting changes to the area to the side of the house, the front garden and the steep rough slope. Of special note were the workmen who obviously knew their business, worked hard and kept me informed about what was to happen next. ( they also impressed my next-door neighbour who is probably going to contact them about his own project !). They turned up reliably every day and on the one occasion they were late by 45 mins ( out of 4 weeks of work), it was due to a van problem; they immediately apologised. It was very reassuring that Kim in the office would contact me by email to confirm that a payments had been received." "Just had some major work done by Gardens Galore.It was a 6 week project which started on time and finished on the date intimated to me. Before work commenced i was furnished with a proposal of works which detailed work to be carried out and materials used.Throughout the project if any problems arose or if i changed anything these were dealt with promptly. Excellent service, quality materials, excellent finish.....Can't wait for the summer!!!" “Very pleased with work on our front garden, now a nice sandstone patio with planters. Very good workmanship from skilled, considerate and pleasant workman. No complaints." "A big thank you to the Gardens Galore team for the fantastic fencing job carried out at my cottage - fast, efficient and tidy. It gives my front garden a whole new dimension - no hesitation in recommending them." "I would like to send a big thank you to Jamie, Scott, Garth and James for all the hard work and effort they put into turning my expanse of lawn into the makings of a real garden. They all made the process from start to finish very easy and I am very pleased with the results. I will have no hesitation in using Gardens Galore again and in recommending them to others. Thanks must go also to Kim for her help over the phone when needed." "We are both delighted with the transformation of our back garden and look forward to moving forward with the planting. Please pass on to your staff who carried out the work, Grant and Willie, our thanks for the efficient and professional way they carried out the work. Throughout their time with us they worked extremely hard, kept the place tidy, and the quality of the finished work is a testament to their skill and dedication. They were extremely easy to deal with and we enjoyed having them with us. Thank you again for your exceptional service and we wish you and your staff every success in the future." "We are highly delighted with our front garden. More beautiful than we thought it would be!! Many thanks." "We were very pleased with the work carried out and the team were very professional in approach. Thank you again for this." "I would like to thank everyone who worked on creating the new space at the bottom of our garden and our new deck. We are extremely pleased with the result and the way the work was carried out. Now we're just waiting on more sun so that we can sit outside! We would definitely recommend your company to anyone else. Thank you!" "We are very pleased with our garden! Excellent result. Great company to deal with. Nothing too much trouble. Hard working and polite team to have in and around your home. Would definitely recommend them!" "In short I have never worked with more professional workers in my life. It was a joy to have them on site and we are extremely happy with the almost end result. Nothing was ever a problem even when certain aspects had to be changed and we hope that they will gain further work from passers by who have seen the transition over the past four weeks. Thank you again for making our garden so beautiful." "The work carried out by your team was nothing short of excellent, Grant and Garth worked like Trojans, even on the the couple of days where the weather was not great, that did not slow them down, and two nicer more pleasant people it would be hard to find." "Please find enclosed our payment for patio building work carried out last week. Thank you for organising, carrying out and advising about this. Your men were very pleasant to have around, worked very hard and were considerate! They made the whole day as painless for me as possible which I really appreciated. Thank you to all!" "Many thanks for the hard work in the garden design and landscape. The front garden is transformed. From the outset GG was easily the most professional group to tender for the work. Although the cost was higher than average it was worth paying for in terms of speed, efficiency and overall quality of the work completed. The staff were friendly and approachable and clearly knowledgeable about their work. We are very happy with the work and will be pleased to use you again for the back garden." "The landscaping looks excellent and you should be very proud of your work force who did an excellent job and one would never know they had been, apart from the finished project being on display.Thank you for your service which I will not hesitate to recommend to friends and family." "Just a few word to express my thanks, upon returning to Gardens Galore, for a job well done, and a team that was both efficient and very pleasant to deal with. If all other businesses took their cue from you, life would be so much pleasanter, all round! " "The service we have received from Gardens Galore has been exceptional, right through from the initial planning consultation to completion of the project. They were very considerate, not only to our needs, but those of our neighbours, informing them of the planned work and timescales. As project manager, Jamie was in regular contact and always available, ensuring we were kept up to date with any developments, including visiting the site if necessary to discuss any changes or queries to the original plans. All members of the team were friendly, efficient and the quality of workmanship has been first class. We are delighted with the results and will be able to enjoy spending time in our garden now. We would highly recommend Gardens Galore to anyone embarking on any garden projects." "We are absolutely delighted with our new garden. Gardens Galore are hard working, professional and have produced high quality results. They made it look easy, although I know it can't have been! I would definitely recommend Gardens Galore to anyone looking for a large gardening project. Thanks again." "Just to say we are delighted with the work done, minimal mess, done very quickly and looks great. Many thanks." "Following my decision to have some landscaping work carried out I was faced with a huge dilemma – who to contact? Making any financial investment, whether that be thinking of buying a car or investing in garden redesign work would normally include research. As I turned to the internet I was overwhelmed with so many different companies offering garden redesign. Gardens Galore stayed number 1 on my list as their customer testimonials were so sincere and positive. The whole process was explained clearly and my own experience was stress-free from the first contact by e-mail to face to face meetings. The skills of the whole team was certainly evident with expert design recommendations, predicted timescales met, high quality workmanship and any questions answered promptly. The transformation has exceeded my expectations and been much admired. Thank you to the whole team at Gardens Galore for an excellent service and one that I cannot recommend highly enough." "We were delighted with the work done by Gardens Galore in September 2013. Everything was done as promised, the planning and documentation were clear and thorough. The team were great, and took great care to keep the area around the site clear at the end of each day. I would definitely recommend the services of Gardens Galore - they were friendly, professional and the work done was of very high quality. Many thanks to Mr Byiers and his team." "We are so delighted with the work - just what we wanted, with the way it was carried out - promptly, efficiently and completely, and with the after service you offer as well. A total package that has ensured we received 1st class service. The team just got on with their job and did it superbly and a special mention for your office staff; anytime I needed to phone through they were so efficient, knowledgable and courteous it was a delight dealing with them." "Over the last year we have had loads of workmen around the house doing different renovations etc. The prize for being the hardest working and doing what you say you are going to do and actually doing it in the time frame you have quoted has to go to Gardens Galore. It has been a joy to do business with you!" Why not visit some of our garden projects for inspiration for your dream garden.